Brian Thomas is a Celtic-folk songwriter from Surrey, British Columbia. Across cultures and generations, music has been a vehicle for storytelling, and Brian’s songs have sought to re-capture that tradition. His peaceful, melodic music frames touchingly human stories and lyrics packed with imagery. Brian blends together finger-style guitar, hammered dulcimer, piano, recorders, and deep, warm vocals to create a refreshingly original sound. Brian had no formal music training as a child, and only began making music when he first picked up a guitar at the age of 17. In the years since, he has learned to play more than ten other instruments, and has written almost a hundred original songs. The stories of his third CD release, Prairie Rain, come with very few words spoken. Mostly instrumental, this album conveys stories through the sounds of the ten musical instruments that Brian plays. 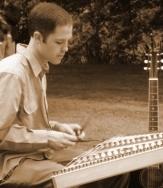 The hammered dulcimer, a recent addition to his musical pallette, takes center stage in several songs, including the title track. Brian says, “One of the greatest challenges as a musician is to be able to convey emotions and pictures in music, and doing that with instrumental songs is even more difficult. How do you make a piano sound like a baby waking up, or a guitar sound like a hawk flying, or a dulcimer sound like a rainstorm? That’s what I was trying to achieve in this project.” The inspiration for much of Prairie Rain’s music came from a journey Brian took with his wife to Scotland and Ireland in the summer of 2006, including a five-day stay on the profoundly spiritual island of Iona. Other songs were written for weddings, both his own and those of friends. Dancing in the Desert, Brian’s second album, is a collection of nine worship songs written while searching for peace in the midst of a time of struggle. Like a majestic, triumphant shout from the top of a mountain, this CD is the uplifting, joyful chapter of Brian’s story. Brian is happily married, and has a baby daughter. He studied music and composition at Trinity Western University. Brian also teaches guitar and piano, and hopes one day to compose and conduct a choral symphony.